The apartment is decorated and furnished to an extremely high standard. The lounge area has two three seat settees and quality dark wood furniture. It is complete with English news channels, German, and Spanish TV. DVD & CD Player, with a selection of DVDs, CDs. There is also a large selection of books and games for your enjoyment. It is nicely decorated with Moroccan style lamps, and wall paintings. It is far more than just 'a rental property'. We consider it an extension of our own home, and take care of it as such. Las Tres Piedras has three good sized bedrooms, with lots of storage space. One twin and two doubles with good quality bedding, mattresses and pillows. Each has its own mirror, dressing table & hair dyer. A contemporary bathroom and separate shower room. It also has a spacious dining area with tables and chairs for six people. The kitchen is large, modern, clean and very well equipped including microwave and dishwasher. The apartment has a huge communal roof terrace, with unspoilt views over the Atlantic as far as the eye can see. You are free to take furniture up to this area to relax, however, there are two private balconies overlooking the beach and park area, both of which are connected to the apartment, and have garden furniture for alfresco dining. The apartment also has WiFi which is free for our clients convenience. April and I brought Las tres piedras in 2002. After coming to Conil in the subsequent years, we grew to love Conil so much we decided to move her 6 years later. Looking after the property ourselves gives us the opportunity to give our clients the benifit of our experience in property management and a 'personal touch' that is lacking in so many other rental proporties. Both April and I have high standards of cleanliness and a willingness to help clients have a fantastic and stress free holiday. We have travelled extensively in the past and like to think that we have thought of just about everything you should need. However is there is something missing, phone us and you shall have it. I guess the unique benifits of Las tres piedras has to be the fact that there are REAL sea views from every window. Not a spec in the distance, you can hear the waves lapping up un the sea when you lay in bed at night. 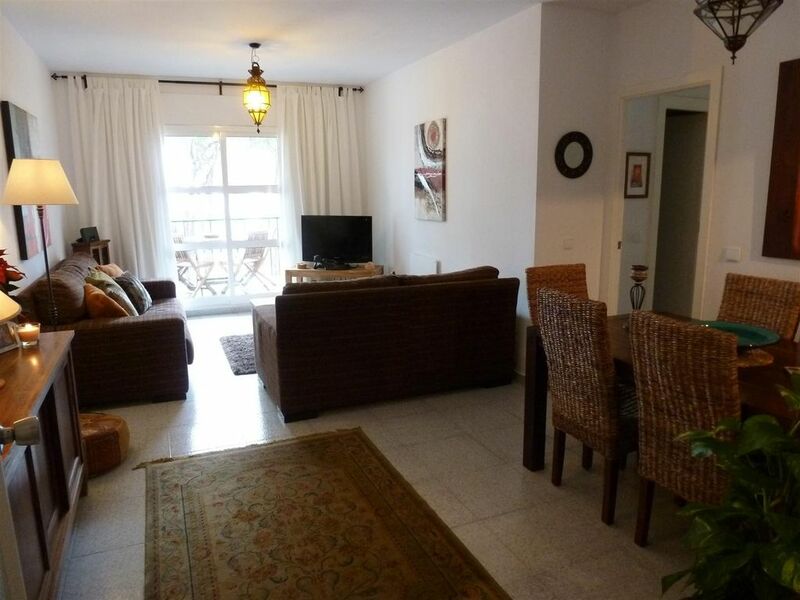 We also like to think that Las tres piedras is one of the best located, decorated and equipped apartment in Conil. We both feel very proud reading the hundreds of lovely comments our clients leave in the guestbooks, many who return year after year. Both bathrooms have locks for privacy, and are decorated in a modern/contemporary style. There is fresh and clean and hand soap dispensers that are supplied. There are extractor fans in both. If you require any more information please ask for our website details,which will provide you with more photographs also. There is parking infront of the apartment block although this is not private. Luxury fitted kitchen with everything you could need. The dining area is attached to the lounge. CD player and Ipod docking station. A large library of books are available in various languages. A selection of board games, cards and boules are free for our guests to use. A good mix of CD's are in the apartment for your enjoyment. there is also an iPOD docking station. There is a large communial roof terrace that is available for guests to use and take up furniture too. We also have two seperate balconies with furniture. Both overlook the park and the sea. Bicycles can be organised at extra cost. Water sports lessons equipment can be organised at an extra cost. Please enquire. The coast of the Costa de la luz has dozens of first class golf courses. The property is secure and child friendly. There is also smoke/carbon monoxide detectors, fire extinguishers and fire blanket for clients peace of mind. We have a night light available, high chair and cot available free of charge. If you require any more information please ask for our website details,which will provide you with more photographs also. We had a fantastic stay in the apartment during the beginning of October. The weather was perfect. The apartment was close to all amenities, beach and town. There are some lovely walks close by the apartment. We enjoyed sitting on the balcony where there was always activity taking place in the park such as pétanque, gym equipment, yoga classes even a wedding taking place. The apartment was furnished as a home rather than just a holiday apartment which made our stay particularly comfortable. It was very clean and the kitchen was well equipped. Contact with April and Andrew was good and there to meet us when we arrived. They were very helpful. We would throughly recommend renting the apartment and hope to return again ourselves. We thoroughly enjoyed our time at the apartment in Conil de le Frontera. The apartment was fully equipped with everything we could possibly need. There was lots of space for all of us (4 adults and 2 children). The location was great...right by the ocean with a playground for the kids adjacent to the building. We enjoyed the town of Conil which was just a ten minute walk away. April and Andrew were quick to respond to any requests we had. Thank you. Again we had a very pleasant stay in Las Tres Piedras. The appartment is very wecoming, beautifully fitted, clean and everything you need is there. Also for families a great place to stay as you have the playground in front of the house and the seaside just a few 10 metres away...with a view to the beautiful Costa del Luz. We so much enjoy the cosy environment and the hospitality of April and Andrew who are there for you whenever you need. We have been returning a couple of times now and can recommend this place to enjoy. Thank you so much for taking the time to review your stay with us. April and I are very pleased that you have enjoyed your holiday and what the apartment has to offer. It is always a pleasure to have clients return to us, and is the biggest compliment someone can make. We hope to welcome you some time in the future once again. Tres Piedras really is a stones throw from the beach. Walk across the park, over the road and then down the stone steps to the fabulous beach of Conil. Miles of sand, a wide beach and a very safe swimming environment for children and toddlers. Warm, clean water too! The apartment itself is very well kitted out. It has things from rain umbrellas, to beach umbrellas, to ironing board, to wheeley trolley for supermarket shopping. Comfortable beds (a memory foam double mattress in one of the rooms, another double and a 2 singles in another room). A pleasant balcony with 4 chairs and a table and another balcony where you can hang washing. The flat is 'friendly' for 6, but it's a town flat, so you'd expect not to be able to swing too many cats! We went with 2 kids and grandparents for most of the week, (grandparents left 1/2 way through). On the 'full disclosure' front, the 2 negatives about the flat are; that there is no air conditioning, and the parking in the vicinity is pretty difficult in the height of summer months of July / August. In the summer, the temperatures are around 30-40 degrees, and air conditioning would have made a huge difference to comfort. Regarding the parking, general rule of thumb is to bring all you need (water, beer, heavy goods) at the beginning of your stay, park the car, wherever you can find a space, and just leave the car there for the week! You can then walk up to the supermarket (there's one around 500m up the road) with the wheeley trolley from the apartment on a daily basis to get groceries. Or walk into town (about 500m) for all the restaurants etc. All in all, it is a fab little flat, for which you'd struggle to find something so close to the beach that is paralleled on comfort and convenience. Wir haben uns in dieser Ferienwohnung sehr wohl gefühlt. Super Ausstattung, sehr nette, bemühte Vermieter und eine tolle Lage. Wir kommen sehr gerne wieder! The apartment delivers what it promises, with the additional, priceless, 'extra' of the delightful owners, who are on hand to make everything easy. I would confidently recommend this apartment to anyone coming to this part of Spain. Conil is lovely for a 'sea, sun and sand' holiday, with a big selection of bars and restaurants. It is worth going for, at least, a day in Cadiz. It was great to meet you all and we are so happy you had a good time in Conil. The Spanish themselves know about the year round delights of the authentic fishing town, Conil de la Frontera. Conil is on the unspoilt Andalucian Costa de la Luz. The Spanish are regulars here and make this area their summer vacation or short-break holiday spot. So the locals ensure the area stays Spanish! With sandy, unspoilt and deserted beaches or tree-lined parks less than five minutes walk, you'll find every opportunity to relax by the sea or take a romantic stroll. Or you can explore the local and quaint towns that simply say' traditional Spain' as you walk cobbled roads and If the smell of the Tapas or a friendly bar doesn't entice you in first, you may make it to the extensive countryside for great views and historic exploration such as Canos de Meca, Bolonia,Tarifa and the majestic and historic Cities of Cadiz.and Seville. For the kids, there is a fantastic zoo in Jerez, and a choice of two water parks in Algeceras or El Puerto De Santa Maria. So much to see and do. We look forward to welcoming you to our property, however the following house rules must be observed. By reserving this property you are agreeing to the following set out below.... This property is for the rental of Family groups only. No groups of adults/youths under 30 years of age will be admitted. Passports will be required for check in at the property, as proof. If this condition is breached we will ask for immediate vacation of the property without compensation. The number of occupants in this apartment must not exceed six people under any circumstances, if this condition is breached we will ask for immediate vacation of the property without compensation. On the day of arrival we will endeavour to have the apartment prepared by 16:00hrs, and possibly earlier. If you would like somewhere to leave your luggage whilst it is being prepared for you, please ask. On departure day we ask you depart the apartment by 10:00hrs in order for us to prepare it for incoming clients. Customers are responsible for keys of property whilst in their possession and we ask you to ensure you leave them in the apartment at the end of rental. We can not be held liable for any damages or injuries to persons or property belonging to any occupant. Parents are responsible for the supervision of children. Although we will offer all help where possible, no responsibility can be accepted by us for accidents occurring in and around the property. It will be the clients responsibility to keep all gates and doors locked when not in apartment. As this is a residential area, levels of noise need to be respectful. If you have any questions at all about the terms and conditions, please do not hesitate to contact us. Thank you, Andrew & April.